As much as everyone is getting excited about Google's cute little autonomous cars, self-driving trucks are the most obvious — and probably easiest — beneficiaries of autonomous tech. 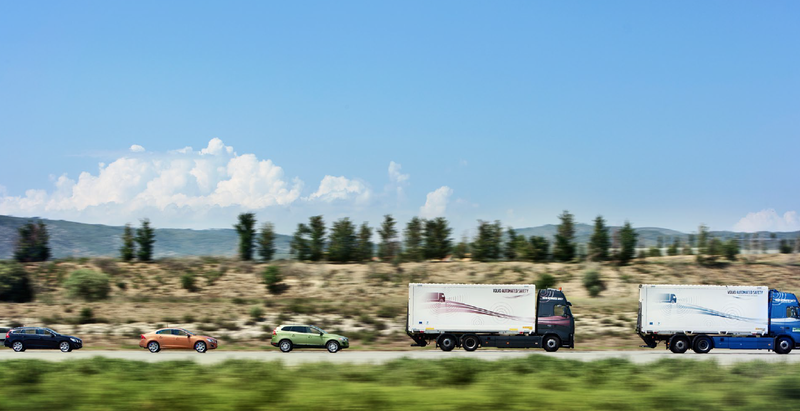 To prove this, a "platoon" of connected trucks from six brands completed a 2092km trip across Europe. A dozen trucks from various manufacturers were participating in the excitingly-named European Truck Platooning Challenge, a proof-of-concept for truck platooning. It's the idea that if you link trucks with Wi-Fi, they can form a tight convoy, using slipstreaming to save fuel, prevent access and make life easier for drivers. Trucks left from manufacturing HQs across Europe and linked up to platoon together, eventually ending the journey in Rotterdam. It's not just the first cross-border demonstration of truck platooning, but also an exercise that involved different manufacturers — all in all a resounding success. Platooning is a whole lot easier than the fully-autonomous vehicles that Google, Apple and basically everyone else are working on. To form a platoon, trucks just need to talk to each other and follow in a line, rather than calculate a complex set of ever-changing variables to navigate the road. In this particular instance, trucks were only platooning on highways, which lack most of the complexities that make city driving challenging. While driverless cars are definitely some years away, it's easy to see truck platooning — and possibly even road trains for passenger cars — coming online much sooner. It's good news for CO2 emissions (and anyone effected by transportation costs), but not so great for the grimier truck stops of the world.